This beautiful Heritage barn style house located in Swan Valley, Montana is a unique and stunning barn style house. Could you imagine living full time or spending holidays and family gatherings in a rustic modern barn like this? This lovely barn style house has scenic mountain and lake views and is located with trees all around. The location of this home design is not the only thing to love. This barn style house doesn’t miss a detail on either the exterior of the log home or the interior. This is country living at its best. The Great room in this modern barn has a beautiful stone fireplace where you could spend lots of cold days sitting in front of the fireplace enjoying the warmth of a fire, and the scenic surrounding views. There are plenty of wooden beams throughout this barn styled build. Inside you have a rustic bathroom with lots of wooden details, rustic country styled lighting, a pool table room, a shuffleboard area and a bar. You would never want to leave; this is what log home living is all about. This barn style house 1,758 square feet in size with a total gross square foot size of 2,420 square feet that include the mechanical room, the storage and a covered screen porch for this log home. You will want to take a look at the photos of this modern barn to see what country living should be all about. When you take the ultimate location and combine with a modern barn build like this, the result is a barn style house that can be treasured and enjoyed by family and friends for a lifetime. This is the type of modern barn that dreams are made. You could easily spend all day just looking at the snow covered mountains and lake, and listening to the sounds of nature in your screen covered porch. This is a nice log home to fill your dreams at night. Imagine spending Christmas here? Modern barns just have something about them, that make us feel at home. You see a photo of a rustic barn, and it takes you to that location and ideal of what life would be like if you were there too. Modern barns are certainly not limited to just one type of design. 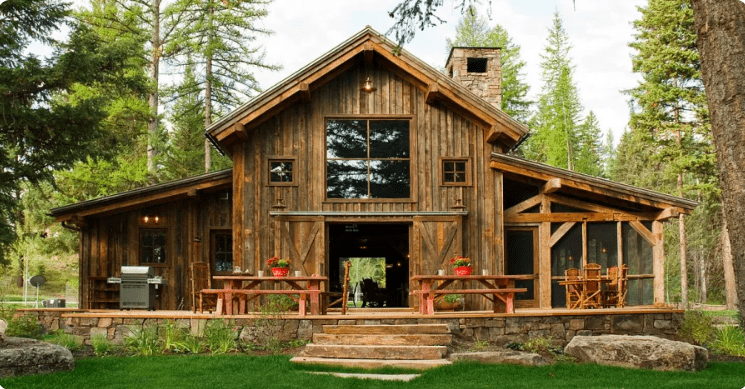 You might choose to go with a rustic style of a barn style mixed with rustic design features inside, with log furniture and logs of rustic wood features, and exposed log beams. You may also want to incorporate some contemporary elements into your rustic home design, and that can work too. You can combine the two designs for a modern barn interior and exterior that are stunning. If you think this log home is beautiful, you will want to take a look at the rest of RMT Architects stunning portfolio of work. When you are considering any home design or modern barn design, you want to go to an architect who shares your vision. To do that you need to talk to different architects, and look at their portfolios to see the type of home design projects they have done in the past, and if they fit with the sort of look and design ideas that you have in mind. It also helps to go with a firm that you feel comfortable with, as it is a project that you will be spending some time on, and you want to be on the same page as the people you are working.